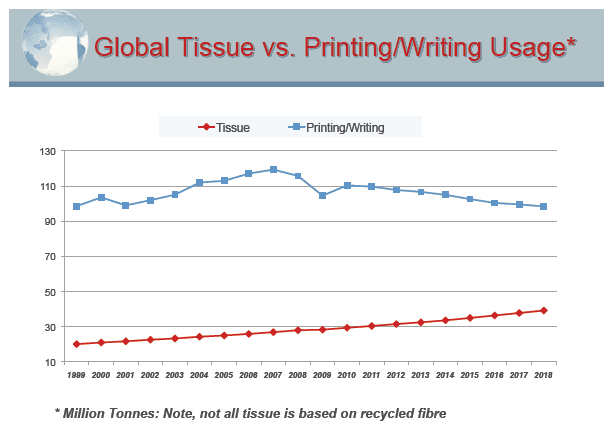 Costs concern as the supply and use of printing and writing papers – the primary source of recycled fibre for tissue/towel production – is declining rapidly as the digital world takes over. 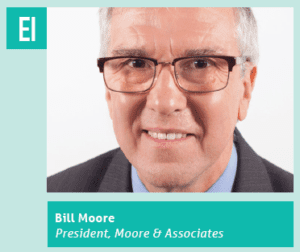 Bill Moore, president, Moore & Associates, addresses the key issues. fibre (RCF) use has declined slowly to the current level of about 40%. RCF is being primarily replaced by chemical fibre pulp. 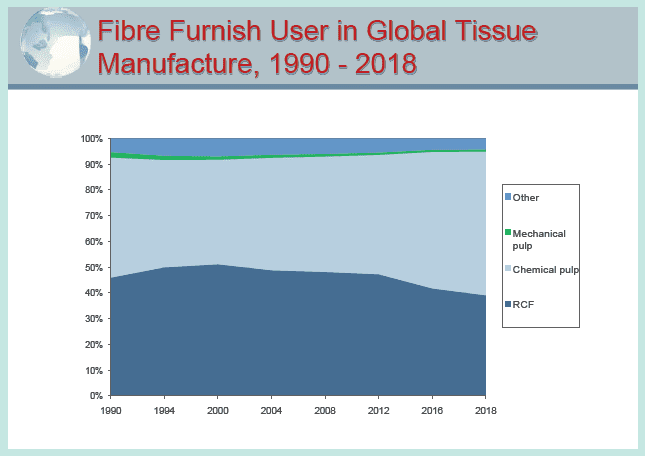 This decline in recycled fibre by the tissue sector can also be seen in Figure 2, the global usage of RCP by paper and board product grade. 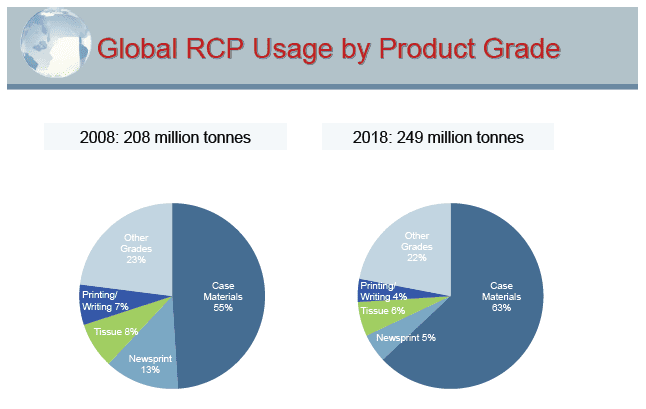 In 2008, tissue grades consumed 16.6m tonnes of RCP (8% of world usage), dropping to 15m tonnes in 2018 (6% of world usage). of recycled fibre for tissue/towel production. Figure 3 shows the global consumption of P&W papers and tissue grades over the last twenty years. From its peak in 2007, global P&W paper consumption has declined from 119.4m tonnes to 98.4m tonnes in 2018. During that timeframe, global tissue consumption increased from 26.9m tonnes in 2007 to 39.2m tonnes in 2018. One needs to note that not all tissue products are made from recycled fibre. P&W paper grades when recovered make up the RCP grade category deinking high grades (DHG). The world’s largest sources of DHG, which are the primary grades of recovered paper used by the tissue sector, are North America and Europe. These developed economies have large usage of P&W paper grades. For tissue produced from recycled fibre, recovered paper costs are a significant component of the overall production cost. The use of recovered paper in the tissue sector is predominantly in the away from home products, and varies by region with North America (US, Canada and Mexico), Europe, developed Asia (Japan, Korea, and Taiwan), and the Middle East having substantial recycled fibre based tissue production. Much of emerging Asia’s new tissue capacity, particularly China (but also Indonesia and others), and a substantial amount of Latin America’s are based on virgin fibre. Because of China’s small role in the global DHG market, the country’s recent RCP import restrictions have had minimal effect on DHG, in contrast to major impacts on the global OCC and Mixed Paper market caused by the country’s significant decrease in imports. However there has been some uptick in DHG demand from China, as some ‘cleaner’ DHG grades are being substituted for lower quality RCP grades that cannot be imported into China. On the demand side, while tissue is the largest user of DHG, there are also several other uses including back into P&W papers production and also making market freesheet deinked pulp. The use of DHG in recycled fibre-based P&W papers is limited to several areas of the world, primarily in the United States, some Western European countries and India. The reason for the limited use of DHG in printing and writing papers is that it is the most uneconomical form of paper recycling because of high yield losses in the deinking process. In comparison, producing away from home tissue products from DHG has been an economical fibre source and is the reason why usage had increased for many decades. The production of freesheet deink pulp and use in P&W papers is declining as overall production of the paper product grades decline. But a major problem with the supply of DHG looms on the horizon and is even obvious today. The use of P&W papers in the developed economies of the world is declining and rapidly so in the US and several other countries of the world. This will constrain the supply of DHG available for use by the tissue and other sectors. Even with growth in the use of printing and writing papers in Asia, Eastern Europe, and several other regions, the decline in North America, Western Europe, and Japan will more than offset this new available supply. Even the developing and emerging countries of the world are not increasing their use of P&W papers as they ‘skip’ hard copy documents in favour of electronic communications. The other major source of DHG, the printing industry, has also been on a steady downturn in the developed world. While the global recession of 2008/2009 caused a downturn in all paper production, the P&W papers and printer sectors were down dramatically. This was not only due to the recession but also a structural trend of producing/printing fewer hard copy documents, which continues to this day and this trend will also constrain the supply of DHG going forward. 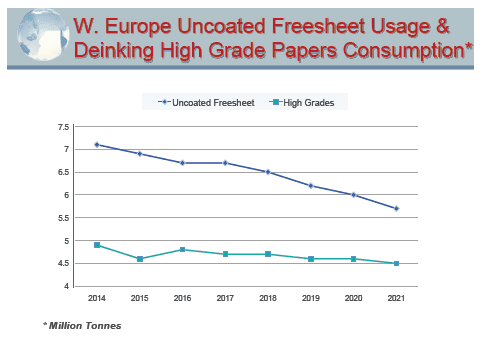 Figure 4 shows the Western Europe balance of Uncoated Freesheet papers (UFS – a large part of the P&W grade category) and DHG consumption over the last five years and projections for the next three years. Over the time frame of 2014 to 2021, UFS usage in the region will decline 1.4m tonnes and DHG demand while declining, will only decrease by 0.4m tonnes. the market price remained steady at what we believe is the top of the market cycle, coinciding with the peak of the global bleached pulp pricing cycle. Going into 2019, Multi Printing and SOP have started to slowly decline. • The 2011 peak of almost $250/tonne represents a good upper bound price for the market going forward. 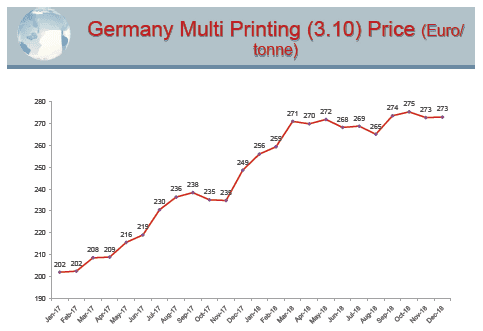 • While 2018 did not reach the full year peak pricing of 2008 and 2011, early in the 4th quarter the monthly price was above $225/tonne and has started to decline into early 2019, the same as the German Multi Printing price. • The bottom cycle pricing of $90/tonne in 2001, $110 in 2005, $135 in 2009, and about $145 for 2013 – 2016 (a long trough!) show a progression upward that Moore & Associates believes will continue. This is a classic characteristic of ‘supply limited’ RCP grade. Expect future bottom cycle prices to increase $5 to $10/tonne in each of the next several pricing cycles. Coated Book Stock (CBS) the either key DHG used by the tissue sector has many of the same supply and demand characteristics of SOP. High quality book printing (which generates CBS) is static to declining. On the demand side the tissue sector has reduced the usage of this low yield grade by process changes and higher levels of coated paper in SOP. 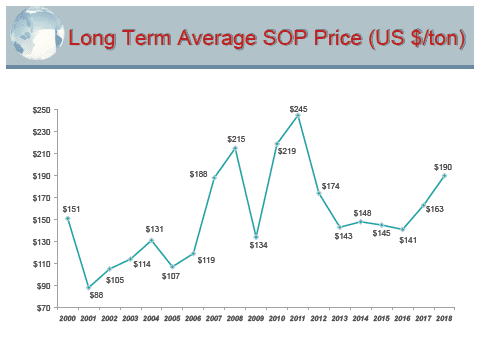 Because of the demand decrease, CBS which for decades traded at prices of an average of 120% of SOP, has been at par with SOP for the last five years and is expected to remain at that level going forward. While we will always have peaks and valleys in commodities like DHG, the overall trend line for pricing over the next ten years is clearly upwards. DHG prices, however, are bounded by the costs for bleached hardwood and eucalyptus pulp as they can be readily substituted for recycled fibres if prices reach levels that are uneconomical. With constrained amount of printing and writing papers going into the available supply, new sources of recovered paper for the recycled tissue industry must be found. One potential source of RCP for the tissue industry is the collection of post-consumer bleached paperboard packaging (both poly coated and uncoated). It is our expectation that more and more of these grades will be recovered; however, their total available supply is fairly small. The growing brown napkin/towel business is based primarily on Old Corrugated Containers (OCC), but we are seeing increased usage of the RCP grade Mixed Paper also in these products. Brown products, particularly napkins, are being favoured by many cost conscious restaurant chains, not only because of price but also because of consumer preferences as to what they see as more ‘environmentally friendly’ products. While we are currently in a cycle bottom for OCC prices, going forward there is very large new demand for the grade as it is the fibre source of choice for corrugated box production. The good news is that the supply of corrugated boxes is growing, very much related to increased E-commerce consumer purchasing. Mixed Paper currently and for the foreseeable future is priced very low – averaging <$10 tonne in a number of countries. Both the OCC and Mixed Paper market slumps have been caused by the Chinese RCP import restrictions. China was the world’s largest Mixed Paper consuming country and their imports of the grade have virtually stopped. Mixed Paper has the lowest recovery rate of the major RCP grade categories, so supply is plentiful. The challenge is the mixed fibre and contaminants found in this ‘catch all’ grade. The other area seeing renewed activity as a fibre source for tissue manufacturing is non-wood pulps: bamboo, bagasse, wheat straw, grasses, and other agricultural residues. Most of the action on these sources of fibre is still in its infancy, but consumer interest in ‘greener more sustainable’ products may be an important driver here. As global recovery rate for all RCP grades increase, it is inevitable that quality is declining. Two factors contribute to this: the ‘next tonne’ recovered of a material is usually always more contaminated than the easy to get materials, and the collection systems to recover materials are more mixed. While this has affected the low grades of RCP more than DHG, the tissue sector has also seen quality decreases in much of its recycled fibre supply. There is a move to better measure and control RCP quality in many parts of the developed world, with Europe leading the way. These systematic and sometimes real time measurements not only contribute to better being able to monitor and control RCP quality, but for the tissue sector, they may play an important role in the fibre recipe and process operation adjustments based on changing RCP incoming quality and composition. The most sophisticated of these RCP measurement systems can accurately measure full bales for moisture, plastics and other contaminants, ash, mechanical vs. chemical fibres and even brightness. All businesses face challenges as condition change in their markets. The sources and usage of recycled fibre in the tissue sector presents some significant issues that the industry is working toward meeting. Share the post "Tissue takes on the looming issue of rapid decline in P&W"